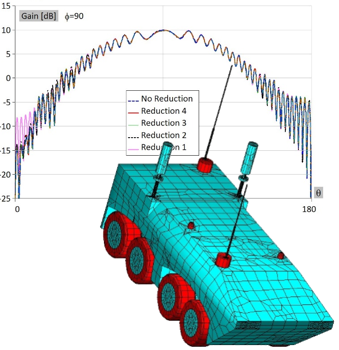 This application note describes simulation of a radiation pattern of a GPS antenna mounted on a combat vehicle resting on an infinite real ground. The motivation behind the work presented in the application note is to illustrate a reduction in a number of unknowns when a WIPL-D Pro feature Unused Entities is used. The reduction has been achieved by realizing that only objects positioned close to the antenna have significant influence to a radiation pattern. Accordingly, in many simulation scenarios, it is not necessary to simulate the entire structure surrounding the antenna. 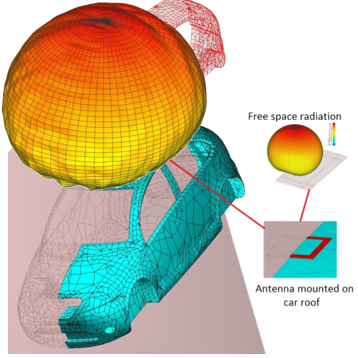 The antenna which radiation pattern will be calculated, is covered with radome and located on the roof of the vehicle. Infinite real ground is placed below the vehicle. All models are simulated at 1500 MHz. The simulations are carried out on powerful desktop computer, with 2 12-core CPUs, sufficient RAM and 4 low-end Nvidia GeForce GTX 1080 Ti GPU cards. All simulation times are in minutes. EM simulations have a significant role in automotive industry. WIPL-D software continuously improves its variety of tools supporting this growing industry. The range of EM simulations has been extended with CAD tools (allowing easy import of CAD files, as well as modeling and positioning of devices in conjunction to complex CAD geometries) and GPU Solver (which extended the range of frequencies where applications can be designed and simulated). Furthermore, WIPL-D introduced Domain Decomposition Solver (DDS), a product, which is intended for simulations of electrically very large problems. This application note holds three applications: GPS, Bluetooth-GSM and FM. They are simulated on a powerful desktop computer, with 2 CPUs (each with 12 cores) and 4 low‑end GTX 1080 Ti GPU cards. All simulation times are in minutes. GPS Antenna Mounted to Car Roof demonstrates basic use where simple patch antenna is mounted to the Citroen shell. Bluetooth and GSM Interference simulates devices working within car shell with various wireless technologies. The scenario includes Citroen car shell with added car seats, GSM mobile device on front seat and Bluetooth devices on the command board. FM Antenna Immersed into Glass Window holds FM receiving wire antenna (108 MHz) immersed into car window along with heating wires. The application note presents Smart reduction, a WIPL-D Pro feature, investigated on the model of a frigate warship. The Smart reduction is very suitable for antenna placement problems. 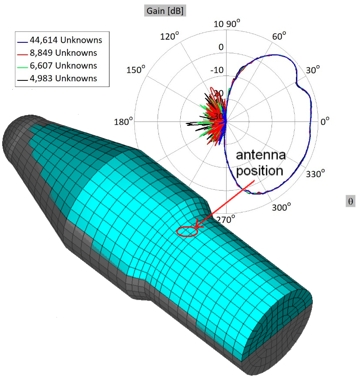 Based on adaptive reduction of current expansion order over parts of the model which are distant from the antenna or in shadow, the number of unknowns can be significantly reduced, while very good accuracy of calculated radiation pattern or coupling between multiple antennas is preserved. Model of the frigate warship is 117 meters long and 12.6 meters wide. The ship is placed above a PEC plane which models the influence of the sea. A monopole antenna is placed on the top of 24 meters high communication tower (the simulation frequency is 240 MHz). The number of unknowns was decreased about 2.5 times without significant discrepancies of the calculated radiation pattern. A 94 wavelengths long frigate is modeled by 33,564 unknowns and simulated in minutes. The hardware configuration is regular desktop PC, where usage of single inexpensive GPU card can speed up simulation time several times. The use of WIPL-D, a 3D electromagnetic (EM) full-wave method-of-moments (MoM) based software suite for full-wave electromagnetic simulation of automotive applications at 24 and 40 GHz is described. This is one of typical illustration of a full-wave EM simulator applications in automotive industry where it is used for accurate prediction of radiation pattern of radar antenna mounted on a car. The frequencies of interest for such applications are usually very high and accordingly, the electrical size of a car, measured in wavelengths, is large, resulting in highly demanding EM simulations. A realistic car shell model has been imported into WIPL-D Pro CAD environment where the model was easily prepared for simulation using repairing, automatic meshing and antenna positioning features. The simulations have been carried out using GPU simulation module to overcome the limitations arising when simulating the models of such a large electrical size. Furthermore, even with the use of GPU, simulation would not be possible without extensive use of various WIPL-D smart features. In particular, with WIPL-D Pro electrically very large problems can be solved using sophisticated approximate techniques with negligible loss of accuracy. Using antenna placement reduction technique, a number of unknown coefficients on parts of the model located far away from the antenna can be reduced since such elements do not significantly contribute to the radiation pattern. In addition, another feature called shadow reduction can be subsequently used to reduce a number of unknowns on model parts not directly illuminated by the antenna. 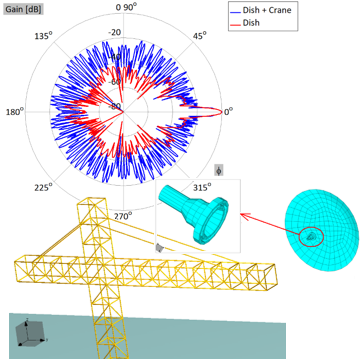 This application note examines the influence of the crane to the radiation pattern of the antenna with parabolic dish. Using Wire entities as building elements enables the code to very efficiently model wire-like structures (such is the crane presented in this document), with many times less unknowns than equivalent all-plate models. Two models are investigated: a solitary dish antenna above perfectly conducting ground plane and the dish antenna in vicinity of a crane above perfectly conducting ground plane. The parabolic reflector diameter is 3.57 m and it is fed by a dual-mode horn with a choke. The system is designed for the operating frequency of 2.8 GHz. The crane is 30 m high and its arms are 28 m long, in total. The radiation pattern with and without the crane is compared. The simulations were carried out on regular desktop PC (or any laptop) lasting just a couple of seconds for both models. 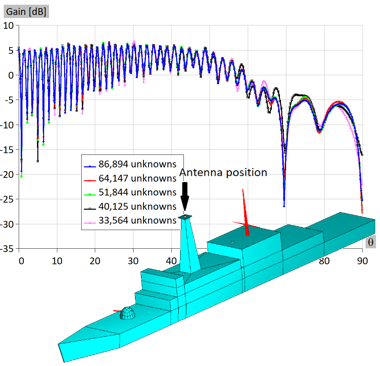 This application notes demonstrates using full wave WIPL-D Pro 3D EM solver for accurate simulation of complex scenario where LPDA antenna is placed below the surface of infinite ice sheet. The calculation of radiation above and below ice needs to be done carefully. The simulation has to be split into two separate calculations. The first simulation is the calculation into the ice (forward radiation). It’s based on solving an inverse problem where the antenna is positioned above the ice surface, and air is placed below. Then, the special feature for calculation of reflection coefficient from infinite earth is used to get the calculation into the ice. Simulations for large size clump should be performed with everyday workstations equipped with inexpensive CUDA capable GPU cards. Single GPU card is sufficient even for the most accurate simulation. Simulation time varies from just a couple of seconds for LPDA in free space (or with minimum clump size) up to 1h for the most demanding simulation (largest clump size to confirm the simulation convergence). WIPL-D Pro is a frequency-domain MoM based code which enables very accurate EM simulation of arbitrary 3D structures. MoM demands far less memory and time resources for open region problems on PC computers or inexpensive workstations. The WIPL-D suite offers highly efficient parallelization on all modern CPU/GPU platforms. Matrix fill-in is greatly speeded up on inexpensive multithread desktop PCs, while matrix inversion for electrically large problems relies to WIPL-D GPU solver. The features intended for antenna placement problems is “smart reduction” or shadow region. The number of unknowns is reduced 3-10 times, with preserved accuracy (radiation pattern or coupling between multiple antennas). λ/2 dipole is placed above a large payload fairing (8.66 m long). At 2 GHz, the fairing length is around 58 λ. With one symmetry plane applied, the model requires 44,614 unknowns. After reductions, the problem is solved with as few as 5,000 unknowns (9x reduction). Discrepancies occur at side-lobes with levels lower than 25 dB. 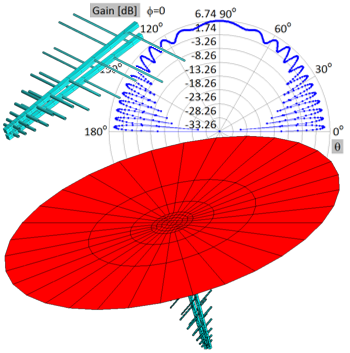 Planar Inverted-F Antenna (PIFA) represents the antenna which is widely used in cell phones and tablet computers. When implemented in microstrip technology, planar inverted-F antenna takes a more compact form then its counterpart – the microstrip patch antenna. This makes PIFA a favorable choice between mobile antenna designers. 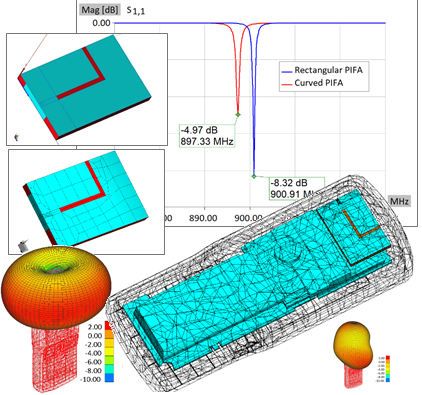 This application note demonstrates simulations of two scenarios describing typical PIFAs operation, the first one where the PIFA is located in a free space and the second one where the PIFA is mounted on the cell phone boards (an antenna placement problem). 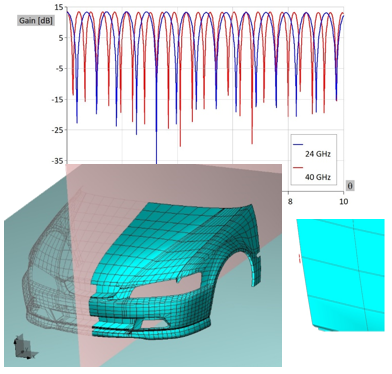 The rectangular and the curved PIFAs are utilized in these simulations. The PIFAs are designed to have dual band properties, at about 0.9 GHz (‘lower band”) and 1.8 GHz (‘higher band’). WIPL-D software (especially with its products: WIPL-D Pro and WIPL-D Pro CAD), a full wave 3D EM Method-of-Moments (MoM) based solver, is used for modelling and simulating the PIFA application scenarios. It will be shown that the simulations demonstrating these real-life (free space and antenna placement) scenarios are efficient (executed in a relatively short time using non-expensive hardware). Calculated results are S-parameters and radiation pattern in two frequency bands corresponding to the bands used in cell phone communication. Finally, it will be concluded that WIPL-D software is suitable for complex modelling and efficient simulation of various antenna-cell phone scenarios.